Don’t store to electrode dry! 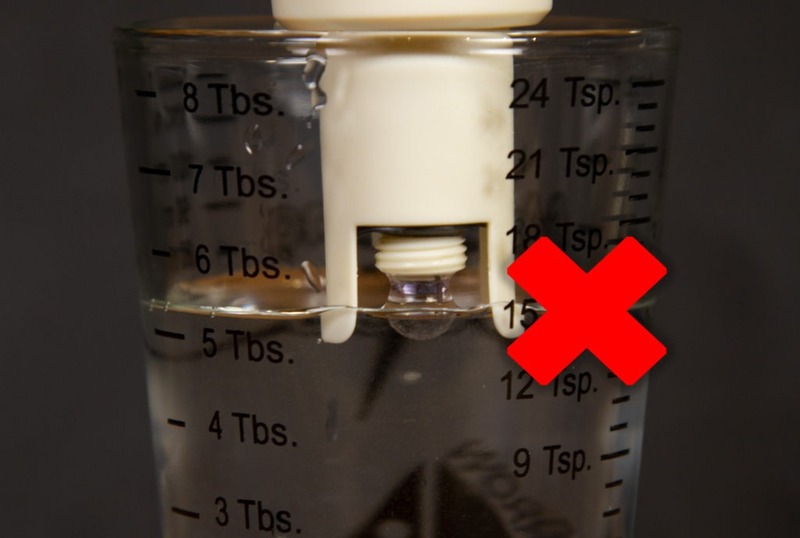 To prevent dehydration, be sure to fill the smaller with storage solution and secure the cap tightly over the electrode after each use. If your electrode does dry out, soak it overnight in storage solution to resuscitate it. It will probably work again, but repeated dehydration is bad for the electrode and will shorten its lifespan. Please note: Some of our new replacement electrodes come with just one larger cap that holds the storage solution in a little sponge against the electrode. 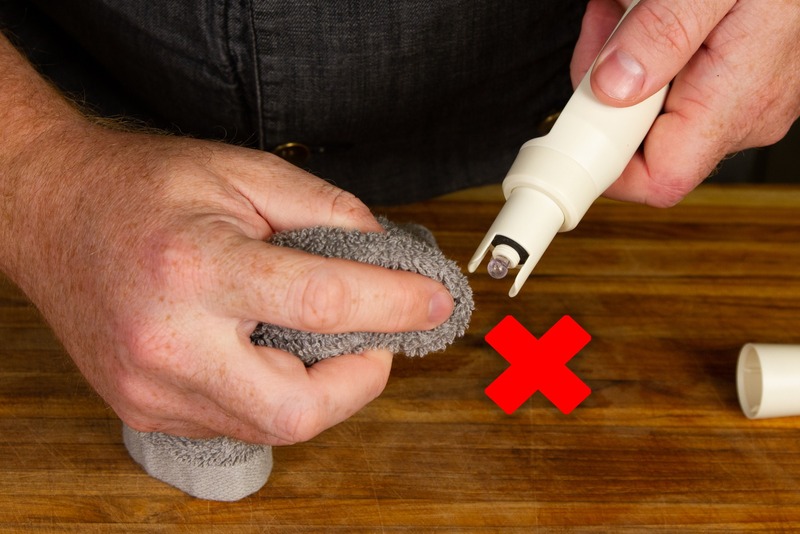 If you have one of these newer replacement electrodes, just be sure to saturate the sponge with storage solution, loosen the threads on the cap to allow the air to escape as you press the electrode into the sponge, and then retighten the cap for storage. When you remove the electrode cap from your meter, there will be a tiny amount of storage solution that clings to the electrode. Do not wipe it off. Why not? Because what the pH meter is actually measuring are tiny, tiny changes in electrical potential. If you wipe the surface of the bulb, you can induce a tiny static electrical charge on the surface of the glass. Though minuscule, this static charge can be large enough to throw your readings off. Some people worry about introducing buffer or storage solution to their sample, but unless you’re checking an exceedingly small sample, doing so won’t change the pH significantly. If you really must clean the storage solution off of your electrode, rinse it in deionized water and blot it dry on a lint-free towel. This will keep it from picking up any charge and will ensure a more accurate measurement. pH testing can be a dirty business. Sticking the electrode in hot milk, fermenting wine, or wet soil can cause buildup on the surface of the electrode that is undetectable to the eye. Fats, sugars, or minerals can accumulate on the electrode resulting in slower or even faulty readings. To make sure your electrodes are clean, use a pH electrode cleaning solution. The cleaning solution is balanced for the electrode and is a great way to make sure you get accurate and fast readings every time. Use the cleaning solution every time you use your meter for optimal electrode life. Another common mistake that people make with their pH meters is storing the electrodes in deionized water. While this seems like a good idea for keeping the electrode hydrated, it can actually destroy your electrode more quickly. Because of the ionic nature of the electrode glass itself, when it is stored in ion-free water, the Law of Diffusion describes how the ions will leave the glass to try to establish an ionic solution in the water itself, creating more equilibrium. 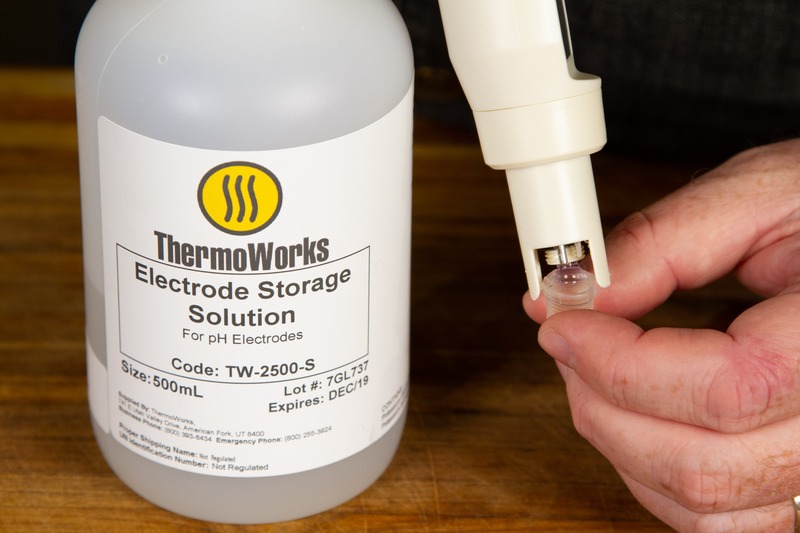 That exodus of those ions from the glass to the liquid depletes the glass of its pH-measuring qualities, rendering the electrode useless.To properly store your pH meter, it is imperative that you use pH-electrode storage solution. The storage solution is hydrating and is properly balanced with the right kind of ions. If you suddenly run out of storage solution during a testing process, deionized water can be used in the very short term until more storage solution can be obtained. pH meters work based on comparison to known quantities. That comparison is established using buffer solutions with a known pH. To properly use a pH meter, you have to calibrate it for every measurement session using a known buffer solution. This will tell the meter what a 7.00 pH ‘feels’ like so that it knows what to expect when inserted into your sample. Without that buffering sample, the electrode will not have any reference for the voltages that will be created, and will therefore not be accurate. As already noted, calibrating every time you use your meter is the best practice. But you also have to calibrate correctly. If you’re measuring something that is basic, always calibrate first using the 7.00 pH reference buffer and the 10.00 pH buffer to establish a proper reading. If you’re measuring something on the acidic side, calibrate using the 7.00 pH reference buffer first and then use the 4.00 pH buffer. Right about here, we really start to see how much more trouble pH meters are than thermometers: the storage and buffering solutions are essential to proper use of your pH meter, which means that any time you measure pH, it’s going to start looking like you’re playing with a chemistry set. For me, that’s a fun thing, but it certainly isn’t as convenient as a Thermapen® Mk4. This mistake is common and easy to fix. The pH meter reads the total electrical potential difference on the surface of the electrode, so, if half of your electrode is outside the sample solution, it’s missing half of the reading. That kind of difference is not acceptable! When you take a sample to test, make sure you take enough to submerge the entire electrode and that your sample holder is deep enough to accommodate the electrode. It’s a simple fix, but super important. pH is actually temperature dependent. At higher temperatures, pH decreases, meaning that acidity increases. While the physics behind that concept are pretty high level, what it means for you is not. 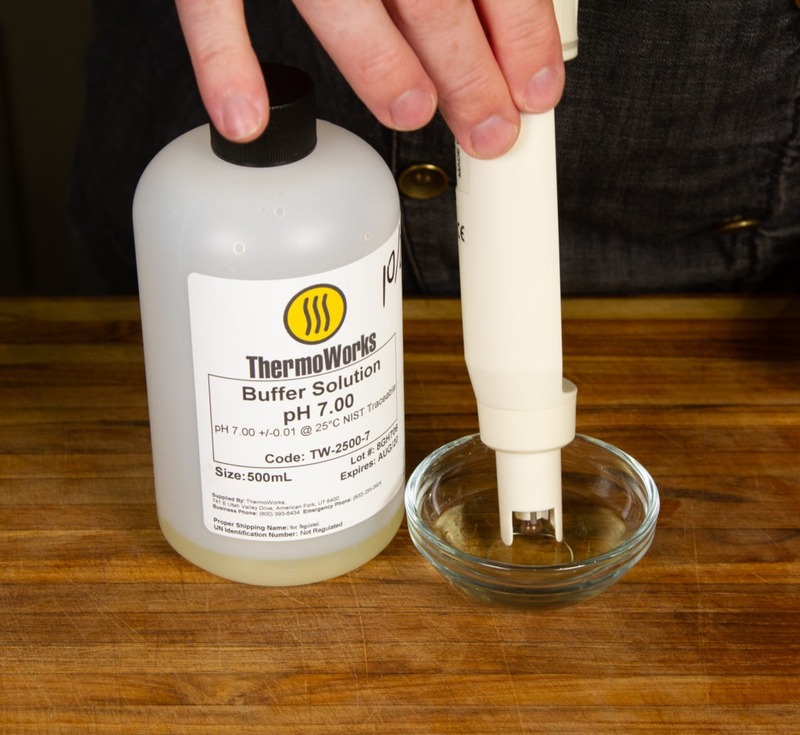 To get a true reading on your sample, you must measure it at the same temperature as your buffering solutions. If you calibrated at room temp, you need to measure at room temp as well, meaning that the best practice is to take a small sample and cool it quickly to room temperature before testing. Otherwise, you can get wild swings in pH readings. Another reason to cool your sample is that electrodes degrade faster at higher temperatures, meaning shorter electrode life. And in fact, have an upper limit of functioning. 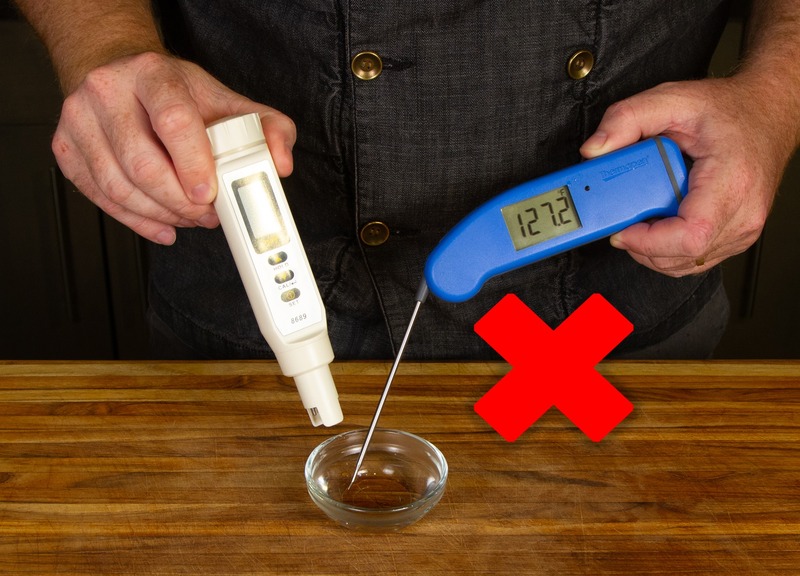 You cannot use your pH meter on anything hotter than 122°F (50°C) or it will burn out. Keep a good thermometer on hand for your pH testing and wait until the sample is at room temperature (about 70°F or 21°C) for best results. pH meters are fantastic instruments that can help you elevate your brewing, cheesemaking, sushi, or even gardening to the next level. Yes, pH meters have their limitations and they’re a little picky about how you handle them, but if you follow the best practices like keeping your electrode hydrated, using calibrating buffer solutions, and controlling your testing temperature, you’ll get the best possible lifespan from your meter. Any questions? Be sure to let us know in the comments below.